Once upon a time, a quirky, design-obsessed writer looked at the writing tools around her and frowned. She frowned because the tools just didn’t look so great and some of them didn’t make much sense. And she saw so many writers around her losing hard work due to technical glitches, and that made her frown even more. But this quirky writer was married to a brilliant, tech-y human. 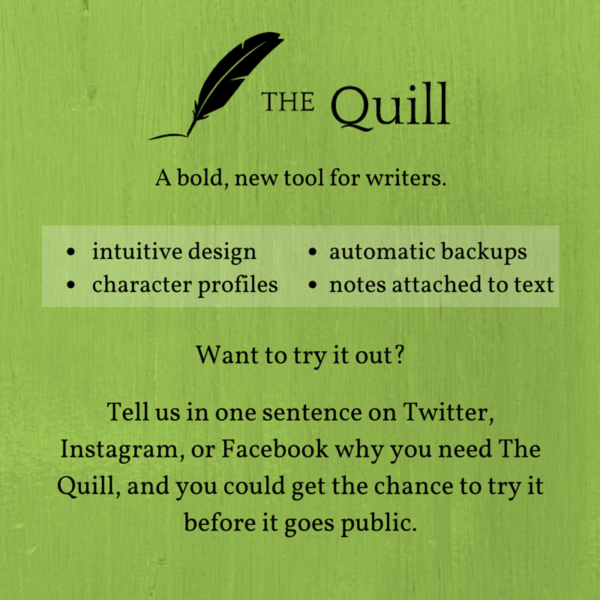 And so he designed things and waved his magic fingers and several months later, The Quill was ready for the world. Well, almost–it’s ready for a few more people to try it out. You want to be one of them?